The global hip replacement implants market was valued at approximately US$ 7.0 Bn in 2017. 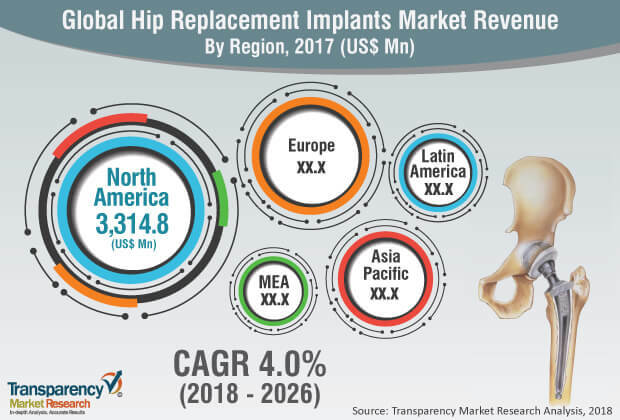 It is projected to register a cumulative annual growth rate (CAGR) of over 3.5% from 2018 to 2026, according to a new report published by Transparency Market Research (TMR) titled ‘Hip Replacement Implants Market – Global Industry Analysis, Size, Share, Growth, Trends, and Forecast, 2018–2026.’ Expansion of the health care industry, government initiatives, increase in health care expenditure, rise in product approvals, and increase in the patient population are projected to augment the global market from 2018 to 2026. As key players introduce their new hip replacement implants in developed regions such a North America and Western Europe, these regions are likely to account for a dominating share of the global hip replacement implants market. Development of health care infrastructure and high medical expenditure by governments in emerging markets such as China and India are likely to boost the hip replacement implants market in Asia Pacific at a CAGR of around 4.0% from 2018 to 2026.